These traditional German pudding recipes make flavorful Old Word bread puddings and creamy baked souffles that you'll be proud to serve to company. These desserts are authentic and delicious. Take 2/3 pound of bread spread with butter, 1 quart of milk, 9—10 eggs, 1/4 pound of currants, 1/4 pound of stoned raisins, both washed and dried, 1/4 pound of crushed almonds, 2 heaping tablespoonfuls of sugar, and the thinly peeled and finely chopped rind of a lemon. 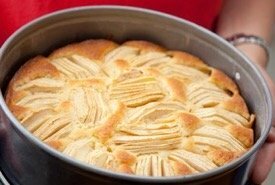 Line a pudding mold with slices of the buttered bread. Then stir eggs, milk and sugar together, pour a little of this sauce over the bread, add some more bread and sauce and finish with bread. Then pour over this sauce a cupful at a time, so that it will be evenly distributed over the pudding. 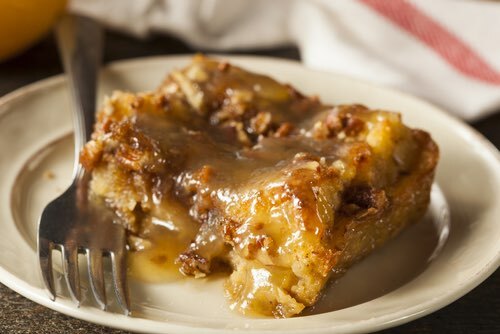 Let the pudding bake for 2 to 2-1/2 hours and serve with a good cream, claret, or fruit sauce. The sauce of the latter should be thickened a little, and there must be plenty of it. 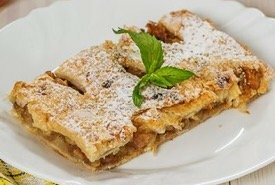 German pudding recipe for 12 to 16 persons. The pudding is prepared the same as in the preceding Zwieback receipt, taking 8 eggs; instead of raisins take 1/2 pound of currants and 2/3 pound of sugar and prepare the same as given in the above receipt. The pudding is served without a sauce and is of a fine flavor. 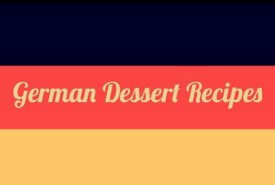 This German pudding recipe is for 10 to 12 persons. Bake 5 thin layers of a good cake dough. Then take 6 ounces of flour, 1 large cupful of cream, vanilla, salt, and 3 ounces of butter and mix to a dough, boil and stir until it no longer adheres to the pan, then add slowly 4 whole and the yolks of 4 eggs, and lightly stir through this the beaten whites of 4 eggs. Then butter a pudding mold, lay in the bottom a piece of buttered paper, put some fruit juice on this, then a quarter of the cream, a layer of the cake, and so on, having for the top a layer of the cake. This pudding is steamed for 1-1/2 hours, then take it out of the mold and serve with an apricot sauce. For 8 persons, take 12 eggs, 5 ounces of sugar, 1 lemon, a glassful of rum, stir the eggs and sugar to a cream, add the lemon juice, and if liked the grated rind of a lemon, rum, and then the froth of the eggs beaten lightly through it; bake the souffle in a hot oven for 10 minutes and serve. The souffle must be of a yellow color on all sides, the inside soft like cream. Omitting the rum and taking the lemon peel and juice only, makes a very nice lemon souffle. Crumb a stale loaf of bread to make 2 cupfuls and soak in 1 quart of milk. Beat the yolks of 4 eggs with 1 cup of powdered sugar; add the bread, a small cup of raisins and the grated peel of a lemon. Mix all well. Put in a well-buttered pudding dish and bake until brown. Beat the whites with a pinch of salt, sugar, and a little lemon juice, spread on the top. Let get light brown in the oven. Serve with wine sauce. Infuse the rind of a lemon for 1/2 hour with a pint of cream, in a warm place. Then boil it, add a teaspoonful of ground rice and two tablespoonfuls of sugar. Boil, stir a little longer, pour into a dish with slices of sponge cake in it, and set on ice. Serve cold. Scald and pound 2 ounces of pistachio nuts, add the yolks of 3 eggs, 1 ounce of powdered sugar, the grated rind of 1 lemon. Beat all well, add the 4 beaten whites, and put in a dish. Sprinkle thickly with sugar and bake till high and brown. Serve at once. When water boiled, Spatzen is similar to dumplings for serving with cooked fruit. Make a thick batter of sufficient flour, 1 egg, milk, and some salt. Beat well and spatter it into a pan of boiling fat with a fork, or by dropping through a colander. Cook 5 minutes, drain, and serve as a garnish to dessert, dusted with powdered sugar. May be cooked in water instead, and browned in oven. Add to a pint of good, rich, boiled custard an ounce of sweet almonds, blanched, roasted, and pounded to a paste, and half an ounce of pine nuts or peanuts, blanched, roasted, and pounded; also a small quantity of candied citron cut into the thinnest possible slips; cook the custard as usual and set it on the ice for some hours before using. Ingredients: 2 teaspoonfuls of flour, 1 teaspoonful of arrowroot, 1 pint of milk, 2 oz of butter, sugar to taste, the rind of 1/2 lemon, 4 eggs, 3 tablespoonfuls of brandy. Mode: Boil the milk with the lemon rind until well flavored; then strain it, and mix with it the flour, arrowroot, butter, and sugar. Boil these ingredients for a few minutes, keeping them well stirred; then take them off the fire and mix with them the eggs, yolks and whites, beaten separately and added separately. Boil some sugar to candy; line a mold with this, put in the brandy, then the mixture; tie down with a cloth, and boil for rather more than 1 hour. When turned out, the brandy and sugar make a nice sauce. A German pudding recipe sufficient for 4 or 5 persons. Seasonable at any time. Ingredients: 1 lb of cherries, 1 tablespoonful of flour, 1 oz of butter, 1/2 pint of water, 1 wineglassful of port wine, a little grated lemon rind, 4 pounded cloves, 2 tablespoonfuls of lemon juice, sugar to taste. Mode: Stone the cherries, and pound the kernels in a mortar to a smooth paste; put the butter and flour into a saucepan; stir them over the fire until of a pale brown; then add the cherries, the pounded kernels, the wine, and the water. Simmer these gently for 1/4 hour, or until the cherries are quite cooked, and rub the whole through a hair [fine] sieve; add the remaining ingredients, let the sauce boil for another 5 minutes, and serve. This is a delicious sauce to serve with boiled batter pudding, and when thus used with German pudding recipes, it should be sent to table poured over the pudding. Sufficient for 4 or 5 persons.